Ships within 1-3 days Free! A pleasing counter top fruit bowl basket. 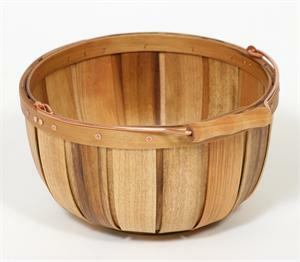 Charming holiday theme basket too...just add flowers, fruit, Easter eggs or pine cones and it's an instant centerpiece! A family keepsake. 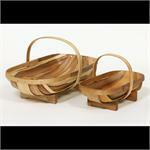 Use the large size for a pie carrier or yarn basket. Finish: Food safe mineral oil Solid copper bale style handle with turned wood grip.